The Colony left Earth to find their utopia–a home on a new planet where their leader could fully explore the colonists’ genetic potential, unfettered by their homeworld’s restrictions. They settled a new paradise, and have been evolving and adapting for centuries. The original humans have been tracking their descendants across the stars, bent on their annihilation. They won’t stop until the new humans have been destroyed, their experimentation wiped out of the human gene pool. Can’t anyone let go of a grudge anymore? 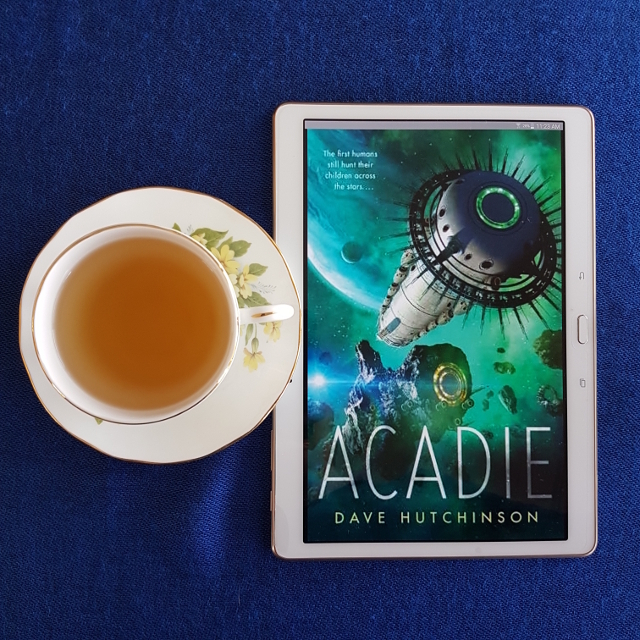 Acadie is an entertaining sci-fi novella, but one that ultimately didn’t work for me. The first line is a good hook, but the story gets off to a bit of a slow start as daily life is established. Although the low gravity makes it plain things are a bit unusual, there were some small details I really enjoyed. For example, low gravity still doesn’t stop cats from chasing each other around the house. Its sense of humour is a strength of the story. John Wayne “Duke” Faraday might be the President of the Colony, but he’s a pretty ordinary guy just looking to enjoy a holiday. In fact, the only reason he’s president was because he was away during the elections. Unfortunately, it looks like the Bureau might have discovered the hidden Colony on his watch. As you might have gathered, the story is full of pop culture references. Duke interacts with people who have genetically engineered themselves to look like the elves from Lord of the Rings or Klingons from Star Trek. The founder of the Colony is Isabel Potter. And Connie’s full name made me chuckle. The author builds a fascinating world in a very short space. There were some great character interactions and enough detail to paint a vivid picture. Unfortunately, the surprise twist at the end undermined the story for me. Although clever, it left me wondering what the point was supposed to be. Can I inquire what the twist at the end was? Twitter DMs are fine if you don’t want to drop spoilers in the comments. I’d heard of this and was trying to decide if I wanted to read it. And sent! I hope it helps you decide.